Alternative Energy, LLC > Air Conditioning > Why Is My Air Conditioner Leaking Water Inside? This post solves the question “Why Is My Air Conditioner Leaking Water Inside?”. 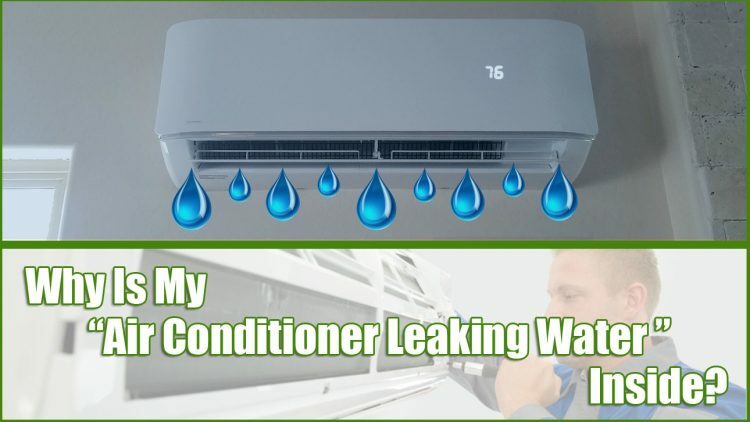 Read this guide to find out the 12 reasons why your air conditioner is leaking water inside your home. The first reason your ac could be leaking water inside is a broken ac condensate pump. To see if the condenser pump is actually the problem, you can troubleshoot the condenser by pouring water into the pan and watching to see if the water is pumped out. If the excess water doesn’t get pumped out, make sure the pump has power, if it does have power; the problem is most likely due to condenser failure. A licensed ac repair contractor should be able to diagnose and repair it. A working condensate pump should pump out the condensate or “water” produced in your ac unit. How To Fix: Search Google for condensate pump replacement for repair and replacement tips to learn how to fix your condensate pump or find a local ac repair contractor. AC water leaks inside your ac unit can also be caused by incorrect ac installation. It is very important the your ac unit be level to work properly. Check the level to see if that is the problem. Most Smartphones even come with a level app so you don’t have to run out to the store to buy one. If your ac unit is level, this is most likely not your problem. If an condenser is out-of-level, it can cause the lubricating oil to separate and the ac compressor to begin operating without lubrication. How To Fix: Search Google for unlevel ac unit for repair and replacement tips to learn how to fix your out-of-level ac unit or find a local ac repair contractor. The water that the condensate pumps removes gets discharged down your drain hole. When this drain hole becomes blocked, the water builds up inside the ac unit and eventually finds its way out somewhere. Things such as insects, mold or dirt can easily cause blockage of this very small hole. Your ac drain hole should be clear from all debris to allow water to flow out of the ac unit. How To Fix: You can easily fix this problem by Google searching how to unclog ac drain line or by sticking a clothes hanger down the line to try to clear out any blockage or find a local ac repair contractor. When the temperatures outside become 60 degrees or cooler, the ac coils start to ice up causing your air conditioner to start leaking water inside the ac unit on top of the coils. It can affect the way the your HVAC system works and cause it to stop cooling to air altogether. How To Fix: You can fix a frozen ac coil by allowing it time to defrost, do a quick Google search with the phrase “air conditioner frozen inside” to see if you can fix the problem yourself or hire a licensed ac contractor to repair it for you. If your air conditioning unit has bad seals that aren’t fitted properly anymore, the can allow hot air to enter the ac unit. When hot air hits the cold air inside the unit, it allows condensation aka water to collect inside the unit at a faster rate than the ac unit can drain the water out. This can cause a water leak inside the ac unit until the problem is repaired. How To Fix: You can learn how to reseal the ac unit by doing a quick Google search for the phrase “home ac leak sealer” or have a licensed ac repair contractor to repair it for. Air leakage inside the air ducts can cause the ac unit to overwork. When your ac unit has to work too hard, it can cause the evaporator coil to freeze up. If your evaporator coil freezes up, your ac unit will only blow out warm air instead of nice cool air like usual. Air ducts need to be sealed properly in order to let the ac unit run at 100% efficiency. How To Fix: You can learn how to seal your own ducts by Google searching the phrase “duct sealing methods” or “air duct sealing companies” if you need to hire a duct sealing contractor near you. Dirty air filters can cause water leaks inside the ac unit the same way air duct problems can. Dirty air filters make your ac unit work harder than usual. Working your ac too hard can cause your evaporator coil to freeze up making your ac system worthless until the coil is thawed. Not only that, but, the melting water inside the ac unit eventually spill over from not being drained quickly enough. How To Fix: Simply replace your air filter with a new one. If you’ve replaced your air filter but your ac is still leaking water inside, Google search “AC Repair Near Me” to find a local ac contractor to troubleshoot and diagnose your ac unit. Experts recommend changing your air filter once a month to keep your ac unit running at max efficiency. Evaporator coils are the number #1reason why ac units leak water inside. As mentioned in the above reasons why air conditioners leak water inside, air ducts and seals can cause the evaporator coil to freeze, causing your air to stop blowing cool. The water leakage is due to the melting of the coil. So, not only are you dealing with your air conditioner not blowing cool, but your also dealing with excess leakage from the evaporator coil while it melts. Your ac’s drain pan is only meant to drain a small amount of water at a time and can easily become over filled. How To Fix: Do a quick Google search for “Central Air Conditioner Freezing Up” to see if you can troubleshoot your problem yourself or search “Air Conditioning Repair” to find a local ac repair contractor. Blocked air vents can create the same problem that faulty air ducts and low refrigerant can. Explore your home to see if you can find any closed air vents around your home. If you find any, close them. Most people think that closing certain air vents will make the air colder in other rooms of the home. This is true but it also caused your air conditioner to have to work harder to cool your home. This will eventually make the coil freeze as mentioned above and you will have to wait for the coil to thaw to begin using your air conditioner again. How To Fix: Open all of the air vents in your home. If you are still having water leakage after closing the vents and allowing your ac unit to completely thaw, Google search “AC Contractor” to find a local experts. If your air conditioning unit is 15 years old or older, the drain pan is most likely rusted and damaged beyond repair. The condensate from the ac just drops right through the pan. This can cause water to build up inside the unit. Most of the time this can be fixed by simply replacing the drain pan but if your ac unit is really that old, you could probably save a lot of money by installing a new ac unit. How To Fix: Do a simple Google search for “AC Drain Pan Replacement” or get a licensed ac installation experts to come out to your home and see if you could save more money on electricity by receiving energy efficient “AC Installation” or “AC Replacement“. Similar to air duct leakage and dirty air filters, not enough refrigerant in the air conditioning unit can cause the evaporator coil to freeze. Evaporator coils are a huge problem when it comes to ac unit leaks inside the unit. The melting coils create condensation between the hot and cold air creating water. The only way to avoid this is by receiving getting on a strong ac maintenance plan. Your ac contractor will keep the right amount of refrigerant in your unit, ensure your air filter are always check and changed and keep your ac unit running at max efficiency. How To Fix: You can try to add ac refrigerant yourself by doing a quick Google search for “How To Add Freon To Your Home AC” or search for “AC Repair” to hire an expert to fill it up for you. Licensed ac contractors can help you repair your air conditioning unit 24 hours a day. If you find yourself in ac trouble in the middle of the night, do a quick Google search for “24 Hour AC Repair” to read reviews about contractors near you.